Spot silver prices continued to surge higher last week following their break out from the recent trending channel and confirming, once again, that once a break from such a technical pattern occurs it invariably results in a dramatic move. Such is the case for spot silver at present as we approach our short term target of $20 per ounce which now looks certain, with the next price level now firmly in view at $21.34 per ounce, a price not seen since February 2008. 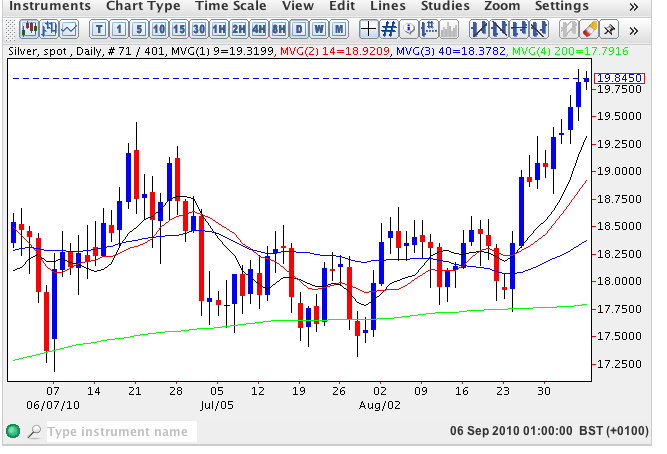 The technical picture on both the daily and weekly chart look increasingly strong with last week’s wide spread up candle fully supported by all four moving averages which is also reflected on the daily silver spot chart. The 9 day moving average here, in particular, is providing excellent support, and with the deep price congestion now firmly established below this is giving us a solid springboard for a sustained move higher. From a fundamental perspective the current “risk on” appetite in equities is helping to propel the industrial metal higher and providing this sentiment continues, then we can expect to see $21 per ounce in the short to medium term.